Kidney, Pelvis - Dilation in a male B6C3F1 mouse from a chronic study. Dilation of the renal pelvis is accompanied by atrophy of the renal papilla. 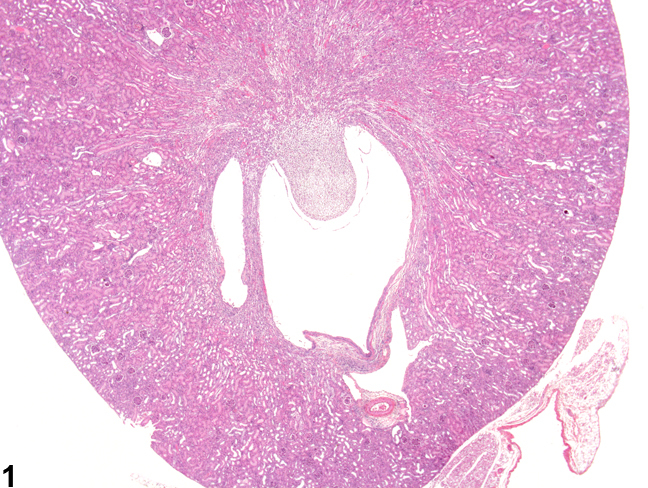 Kidney, Pelvis - Dilation in a male rat from a subchronic study. A more severe case of renal pelvic dilation is shown. Dilation of the renal pelvis is preferred over the term “hydronephrosis,”which can denote either a gross necropsy or microscopic change. Dilation is characterized by distention and dilation of the renal pelvis,usually accompanied by renal papilla atrophy ( Figure 1 and Figure 2 ). This lesion may be a common finding in rodent studies and can be either primary or secondary to an obstructive lesion of the lower urinary tract. 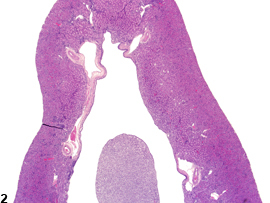 Primary cases are often noted as congenital and are noted predominately in the right kidney of rats. There is no such predilection in mice. Bilateral cases have been reported. Many etiologies are associated with renal pelvis dilation, mostly related to obstruction of the lower urinary tract. Some cases of renal pelvis dilation can become quite severe, resulting in a grossly dilated kidney with little parenchyma remaining,or even death. Dilation of the renal pelvis has been induced from prenatal exposure with some chemicals by causing ureteral changes and subsequent urinary blockage. Dilatation of the renal pelvis should be diagnosed and given a severity grade. If bilateral, the term "bilateral" should be included as a modifier in the diagnosis. 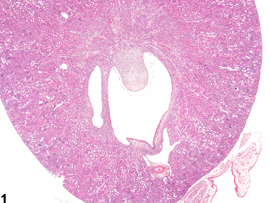 Renal pelvic dilation can be noted at necropsy, so there is often a gross-microscopic correlate that should be cited. If possible, the cause of the dilation should be identified and described in the pathology narrative. Friedman J, Hoyer JR, McCormick B, Lewy JE. 1979. Congenital unilateral hydronephrosis in the rat. Kidney Int 15: 567-571. Gage JC, Sulik KK. 1991. Pathogenesis of ethanol-induced hydronephrosis and hydroureter as demonstrated following in vivo exposure of mouse embryos. Teratology 44:299-312. Maronpot RR. 1998. Spontaneous hydronephrosis, rat. In: Monographs on Pathology of Laboratory Animals: Urinary System, 2nd ed (TC Jones, GC Hard, U Mohr, eds). Springer, Berlin, 306-309. Percy DH, Barthold SW. 2001. Rat. In: Pathology of Laboratory Rodents and Rabbits. Aimes: Iowa State University Press, 151-152.